Print your 3D model in a Yellow color with the Kodak 1.75mm PLA+ Filament. Polylactic Acid (PLA) is extracted from corn, sugarcane, or other sugar-containing crops. PLA+ is an improved version of PLA, with up to nine times the impact resistance. 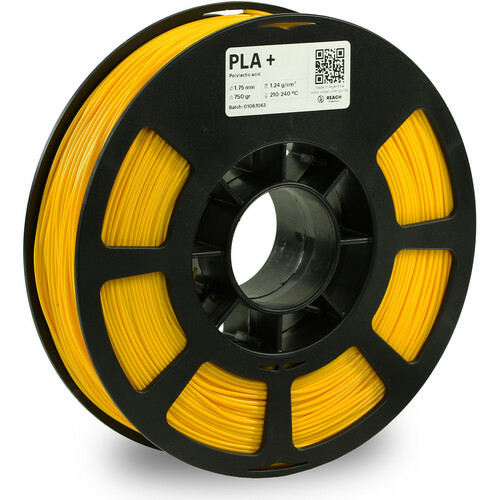 PLA+ also shares the same high impact resistance of ABS, but with lower shrinkage and warping. With fast crystallization, PLA+ can be printed without supports and in very fine detail. Ideal for high resolution or fast printing, PLA+ can be used for architecture and concept modeling. Box Dimensions (LxWxH) 8.5 x 8.0 x 2.1"